Want to keep your natural teeth for as long as possible? Of course you do! In order to do this, you not only need to take care of your teeth, but the structures that surround them as well, namely the gums. Without proper care, a person can easily develop gum disease, which is actually the #1 cause of adult tooth loss in the US! 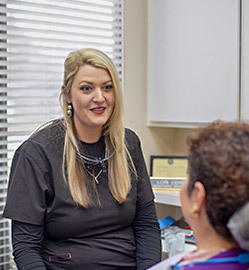 To make sure our patients’ smiles stay nice and whole, our team performs gum screenings at every routine checkup, looking for signs of infection. If we find anything, we have a number of therapies that can target and eliminate bacteria before it can cause any damage. Why Choose Glow Family Dental for Gum Disease Therapy? Gum disease usually develops due to a lack of oral hygiene, which allows plaque and bacteria to accumulate below the gum line. 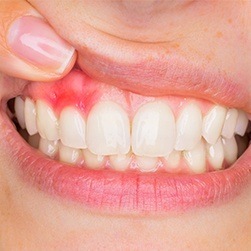 Early symptoms can include red, swollen, or tender gums that bleed whenever you clean them, but left untreated, the infection can become much more serious. Advanced gum disease can lead to gum recession, chronic bad breath, loose teeth, and eventually…tooth loss. In addition to the issues it can cause for oral health, gum disease has also been shown to have a strong link to several overall health problems, including diabetes, heart disease, and even dementia! 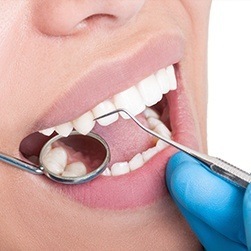 If we determine that a patient does indeed have gum disease, our first course of treatment will involve a deep cleaning known as scaling and root planing. First, an ultrasonic cleaner will be used to break up and remove any plaque and tartar built up around the gums (scaling), and then the rough surfaces of the teeth’s roots will be gently smoothed out. Why do this? This makes plaque less likely to gather on the gums in the future, protecting a patient from reinfections. To help us reach bacteria that is hidden deep below the gum line, we can place what is called a PerioChip into a patient’s mouth. It’s a small disc only a few millimeters wide that is actually a congealed form of a powerful antimicrobial agent. We can place a chip just below the gum line, and it will slowly dissolve over the next few days, enabling the medicine to kill any leftover bacteria. Up to eight PerioChips can be placed at a time depending on the extent of a patient’s infection. Gum Grafting : Gum recession, in which the gums actually pull away from the teeth, not only affects the appearance of the smile, but it also makes the teeth much more likely to develop decay. Gum grafting uses a small portion of a patient’s own oral tissue to replenish their natural gum line, restoring both health and aesthetics to their smile. Periodontal Plastic Surgery : If the gums have any kind of aesthetic issue, periodontal plastic surgery can be used to reshape the gum line and give it a more pleasing appearance. This is often the solution for people who have a “gummy” smile. 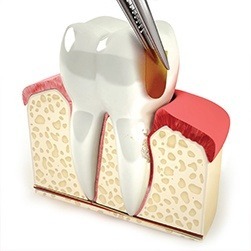 Periodontal Laser Treatment : For advanced cases of gum disease, a soft tissue laser can be used to quickly and painlessly eliminate both bacteria as well as infected tissue. The laser’s beam of light can instantly vaporize oral bacteria and remove dead tissue without causing swelling, bleeding, or pain, making it much gentler than a traditional gum treatment. Of course, as with all dental problems, our preferred approach is prevention. Fortunately, taking great care of your gums is very similar to looking after your teeth. Patients simply need to brush and floss regularly as well as come see us for routine checkups and cleanings. The key is to make sure you brush where your gums meet your teeth and floss slightly under the gum line because this is where bacteria is most likely to gather. Using tobacco of any kind can bolster harmful oral bacteria as well, so avoiding these products is the best way to ensure your long-term oral health. Alcohol and certain medications can also lead to dry mouth, which makes it much easier for gum disease bacteria to multiply. Avoiding excess alcohol, potentially switching to a different medication, and chewing sugar-free gum are all excellent ways to lower your risk of developing gum disease.